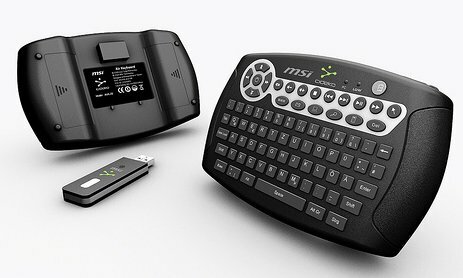 MSI has teamed up with Cideko to launch the Air Keyboard, a wireless keyboard designed for HTPCs. The special thing about this compact QWERTY keyboard is that it includes both gamepad and Wii-like gyroscopic sensors for cursor control. The Air Keyboard connects to your PC with a RF USB dongle and has a maximum range of 50 meters. The Air Keyboard was first introduced last summer by Cideko and will be co-branded when MSI introduces it in Germany. The mini QWERTY keyboard measures 14.2 × 8.8 × 3.3 inches (WxDxH), and includes both gamepad and Wii-like gyroscopic sensors for cursor control. It connects connects via USB port with an included RF dongle. Range is up to 50 meters. Two AA batteries provide up to 50 hours of use, according to MSI. The keyboard will be launched in Germany next month for 79EUR. It's unknown whether it will also be launched in other parts of the world.